Today, the Royal National Institute of Blind People (RNIB) launches its bus campaign: Stop for me, Speak to me. The campaign is calling on bus operators to remove the barriers blind and partially sighted people face when making a bus journey. To help overcome issues such as trying to flag down, board and get off a bus at the right stop, RNIB is calling on bus operators to remember one simple rule: Stop for me, Speak to me. Many respondents found it difficult to hear the bus driver through the assault screens meaning they couldn’t obtain the necessary verbal information they needed to make their journey. Shirley Grisedale, 62, from Penrith in Cumbria, is registered blind. She said: “I have been left stranded at the bus stop when buses have sailed past me and not stopped. Because I live in quite a rural area, a lot of the stops are not compulsory stops and therefore the drivers won’t stop if you don’t stick out your arm. include a slide open section in any new or replacement assault screens to enable drivers to clearly speak to customers with sight loss. New EU Regulations on passenger rights in bus and coach transport come into force on 1 March, 2013. The new rights awarded by the EU to disabled people offer more protection than the Equality Act, in particular in terms of access to travel information and assistance. James Freeman, CEO of Reading Transport, welcomes RNIB’s report and fully supports the campaign. 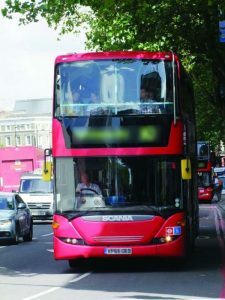 RNIB’s research found request stops, which put the onus on the customer to signal they want an approaching bus, are in use by most bus operators across the UK. However the report shows that they significantly disadvantage people with sight loss. Request stops can mean that a blind person has to travel with a friend, ask strangers for help, hold up a large sign with the bus number, or risk missing the bus they want. Survey respondents told how it’s vital for bus drivers to speak to passengers with sight loss so they can make their journey. However, the survey revealed nearly seven out of ten people said their driver failed to tell them when their stop was approaching. Join our campaign. If you think blind or partially sighted people shouldn’t be left behind at bus stops visit www.rnib.org.uk/bus or call our helpline on 0303 123 9999. Be the first to comment on "Stop for me, speak to me"